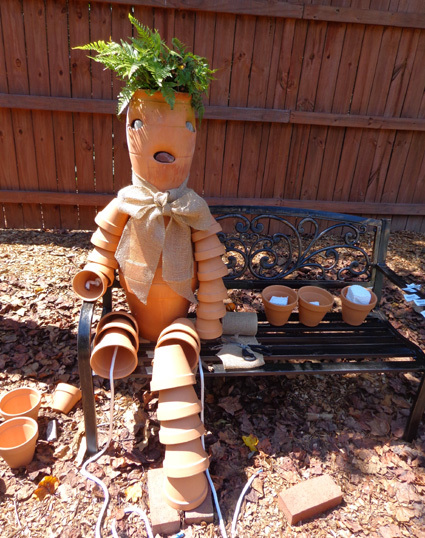 FROM SUSIE THE "POT WOMAN"
this garden arts craft project is fun for all ages." Had ya going' there, didn't I? "Pot" isn't legal in Georgia, even medical marijuana. 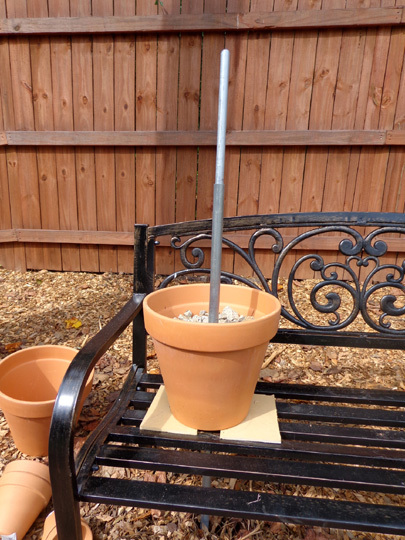 I'm talkin' about clay pots and the creative ways I learned that people are using them in landscape design and other places. This entry is a continuation of the last one about settling into our new home in Peachtree City this year. 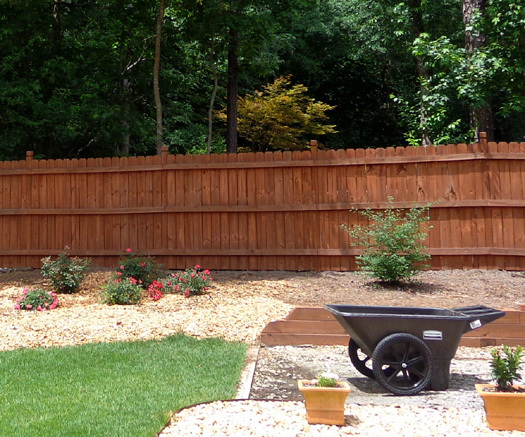 On this page I'm focusing mostly on the large -- and largely un-landscaped -- back yard we inherited and what we've done this spring and summer to make it more appealing. The only flowering shrubs in the back yard were some small hydrangeas with pretty blue flowers. 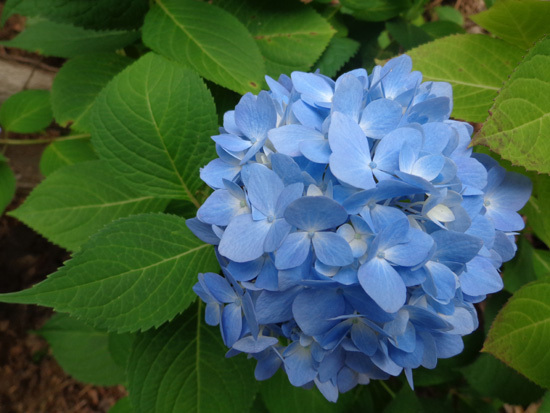 Hydrangeas bloom blue in acidic soil and pink in more alkaline soil. 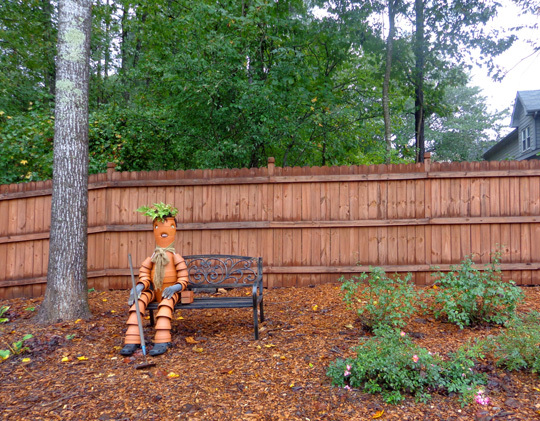 One of the ways I decorated a section of the back yard is by making a clay pot person sitting on a garden bench. 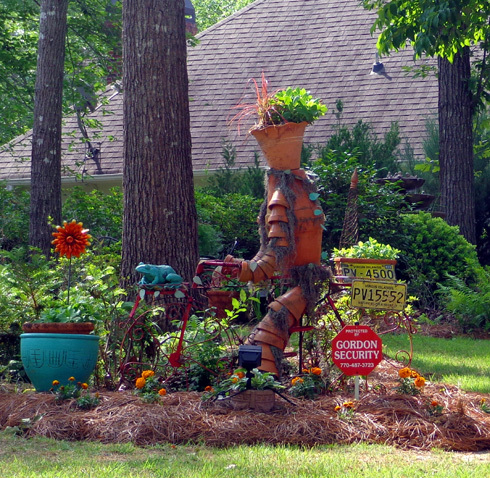 Until I saw a similar pot person in someone else's yard along the bike path in our neighborhood, I had no idea it was such a popular craft. When we bought our twelve-acre property in Virginia in 2004 we inherited some large beds of beautiful perennial flowers. That wouldn't have been a problem if we'd been there most of the time and could keep up with maintaining the beds a little bit at a time but with our extensive RV travel each summer, when we'd return in the fall I'd have several weeks' worth of weeding to do. 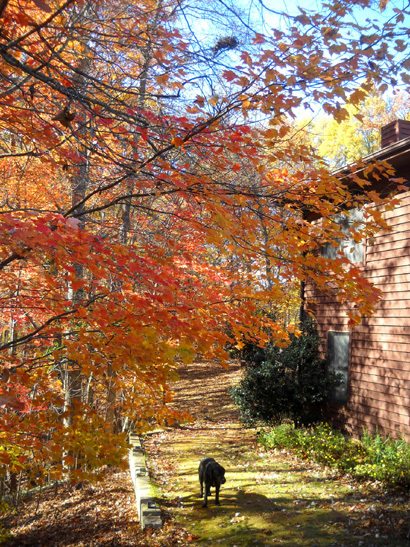 That and dealing with all the fallen leaves from deciduous trees on the property killed the anticipation of going back to the house every autumn for ten years. in the lawn and gutters. Cody helps me with weeding, below. 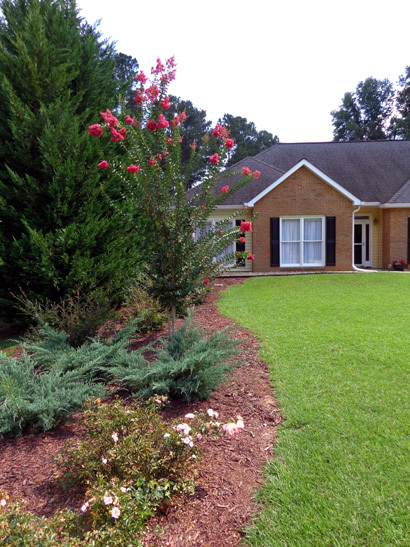 With this house in Georgia, I was hoping for attractive, mature landscaping that didn't require a lot of work. The back yard is a different matter, however. We've been very busy back there, much busier than we anticipated. Because of my grandiose landscape plan and several big rainfalls, it's been even more labor intensive than the large perennial beds and lawns we had in Virginia. 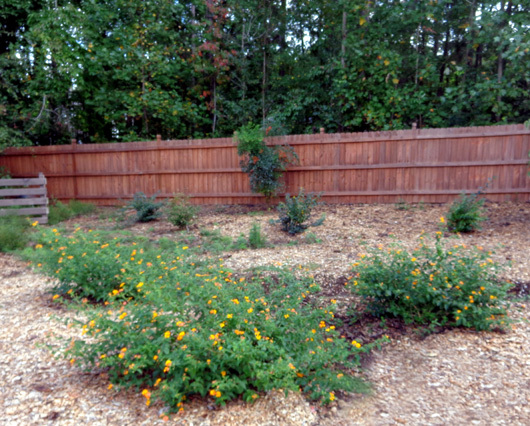 The sellers took out 40+ large trees several years ago and left the back yard pretty much un-landscaped except for a few small trees, a nandina bush, a holly, four hydrangeas, a very large and sparsely-mulched area, and some nice zoysia lawn that turns brown in the cooler months. 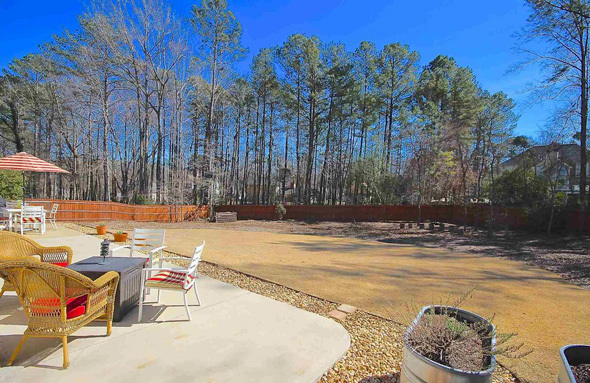 When we saw the house in February we noted the large expanse of wood chips and pine straw mulch and knew we'd have to replenish it this year. We didn't realize how many weeds would grow there, however, nor the erosion problems during hard rains, thanks to them taking out all those trees. Back yard "before:" MLS shot from back of the house; the zoysia grass greened up in April. 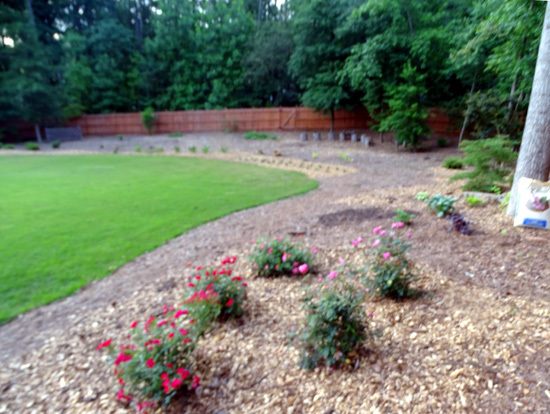 much of the back is mulch and not grass-- a least two-thirds (not all of it shows here). 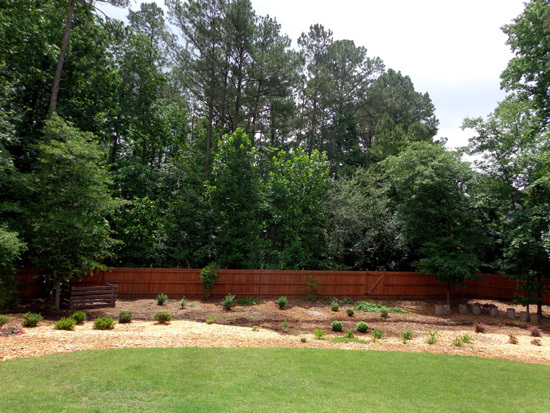 I love a good landscaping challenge so I viewed the large "blank slate" in the back yard as an opportunity to plant things I can choose rather than inheriting something less appealing than my vision. While waiting to close on the house I drew a detailed-but-tentative landscape plan with flowering trees, shrubs, perennials, and groundcovers to fill in the mulched area. It would have been the sensible thing to do to buy a few of the plants this spring and fall, then add to them gradually over the years until we had the yard nicely landscaped. Sensible for someone younger, maybe, but we're in our late 60s and I didn't want to wait till I've got one foot in the grave before seeing the landscape filled in more fully! I've made the mistake in some other yards of buying new small plants to save money and then moving before I got to see them get large enough to really enjoy. 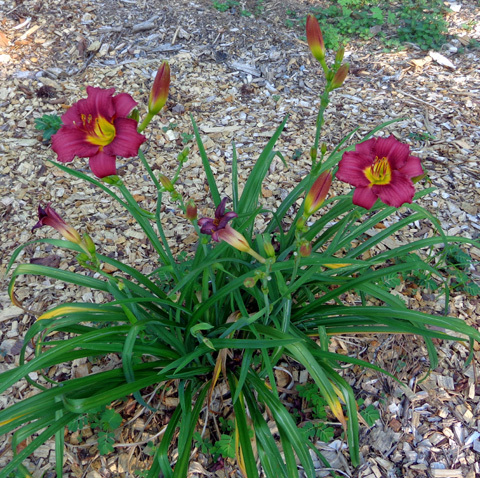 I planted about 15 daylilies in different colors; they got larger and will multiply. Since it takes time for plants to mature, I hit the ground running a couple weeks after we moved in, spending a pile of money, mostly at Pike's Nursery, on Encore azaleas (which bloom continuously from spring to fall, not just in the spring), Knockout and Drift roses, forsythias, viburnums, lantana, barberries, daylilies, coral bells, hostas, spidorwort, and other shrubs, perennials, and groundcovers that I've successfully grown previously in the Atlanta area. 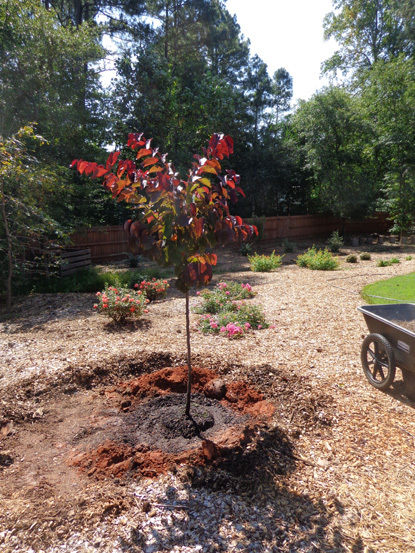 In late September we added a redbud tree and a pink dogwood tree. I'll plant bearded irises and spring bulbs in October or November. 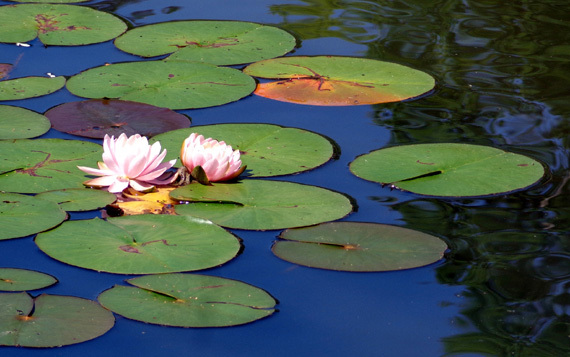 year round and pretty purplish-pink flowers in the spring. I bought medium-sized plants, not the smallest ones -- although they look pretty small in these pictures -- so they'll mature faster and we can enjoy our yard sooner. Digging dozens of holes, planting everything, and watering frequently during the spring and summer has been a lot of work but satisfying to me. together and already too big for their cages by the end of May. Almost everything is flourishing except for a few azaleas that may have gotten too wet in a low area of the yard and a few perennials that died from unknown causes (the perennials may come back next spring so I haven't given up on them yet). All the trees and shrubs from Pike's are guaranteed for life so they can be replaced at no additional cost, if necessary. The roses and Encore azaleas have bloomed prolifically and are still blooming in October, when I'm writing this. 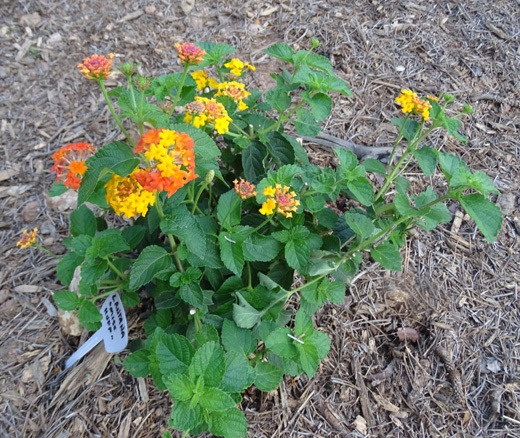 All of the plants have grown in size -- the lantana quadrupled in width and height! -- and some of the perennials and groundcovers have already multiplied. above from mid-May); now the largest is over 3 feet high and 4 feet wide (below). doubled in size and bloomed prolifically into late fall. I guess one thing I forgot about gardening in Georgia is that with the right plants in the right place, weather conditions are usually ideal for growing large, healthy plants. I think we planted the shrubs, trees, perennials, and groundcovers far enough apart to allow for eventual prolific growth -- I read the labels carefully re: expected height and width -- but we'll have to remember to give veggies more room next year. One of the things I missed about traveling full-time in our RV was gardening. Now I'm happy to play in the dirt again! I just don't love the weeding. 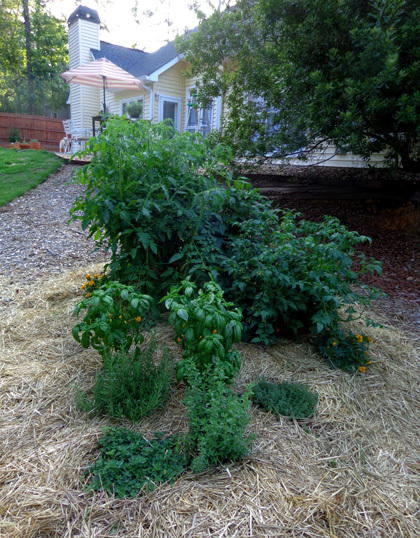 We knew when we bought the place that we'd have to periodically replenish the mulch in the back yard with more pine straw and/or wood chips until we can get groundcovers established. Soon after we planted most of the shrubs and perennials in the spring we made a few trips to the city mulching area to load free mulch into the truck. 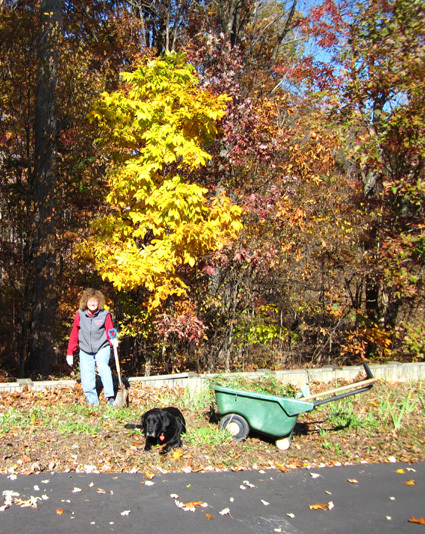 That took us a long time, was hard on us old folks, and the mulch didn't go very far. We needed to find another way to do the job at not a lot of cost and less hard labor. much easier than the small garden cart with little wheels we used for many years. 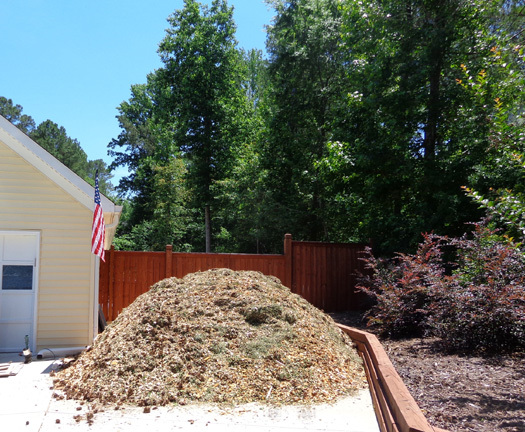 When a neighbor had some trees cut down, we talked to the tree company and found out they are happy to give homeowners the mulch when they have a "clean" load. 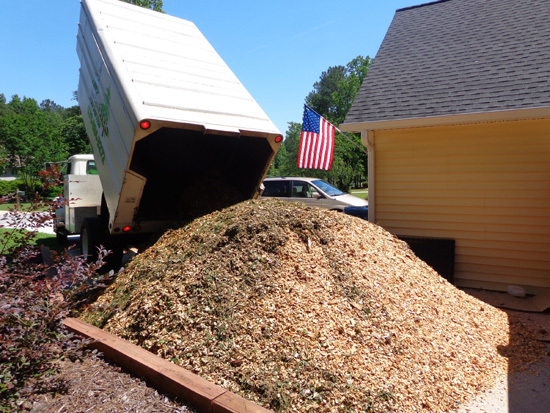 We arranged for them to dump a huge truckload of "clean" mulch in our driveway a few days later for only $50. It took us a total of about 20 man-hours to distribute all of it but with a new garden cart with large wheels, the job wasn't too formidable and the yard looked better. Above and below: Warning: the pile is larger than it appears in these photos! 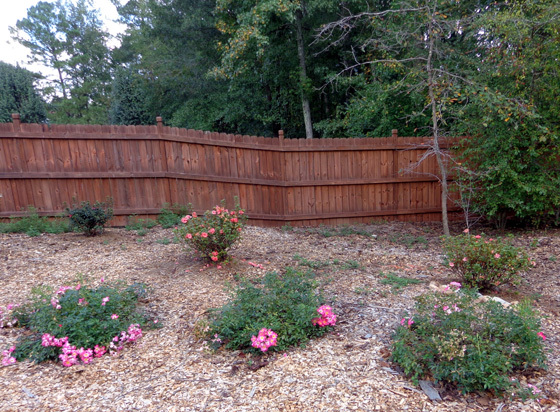 I knew we needed more mulch to make it thicker and to cover all the way to the fence. So when Monster Tree Service called again a couple months later to see if we wanted another load -- free, since they initiated the call! -- from a huge oak tree they'd just cut down, I said yes. That brand new mulch sure smelled good but we had smoke coming out from the pile until we were able to move it all off the driveway -- it was wet when it was cut, and burning! I had no idea that was even possible. After a couple of rainfalls we couldn't tell that any of the mulch had burned. I think that's enough mulch for one season . 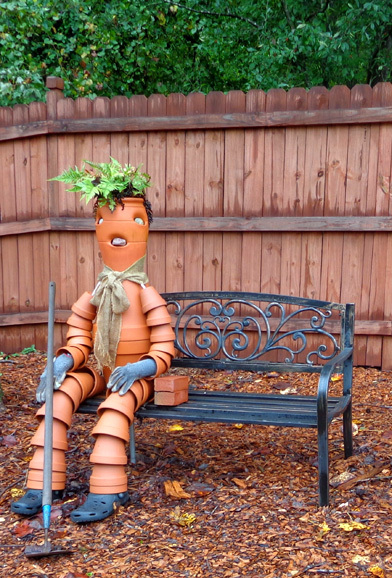 . .
One of the most fun projects I've had in the back yard was designing and building a pot person. Since it looks more like a pot woman so I named her Susie and put a garden hoe in one of her hands. As soon as I saw it, I knew I had to have one in my back yard, too. Their pot person sits on a rusty old bike. I didn't know where to find one of those so I imagined one in our yard sitting on an old rusty garden bench. I was too busy decorating the inside of the house to spend time hunting for one of those so I ordered a handsome new bench for only $62 from Wayfair.com -- and I'll let it weather gradually. After it came Jim assembled it and sprayed it with clear lacquer so it won't deteriorate for a while. 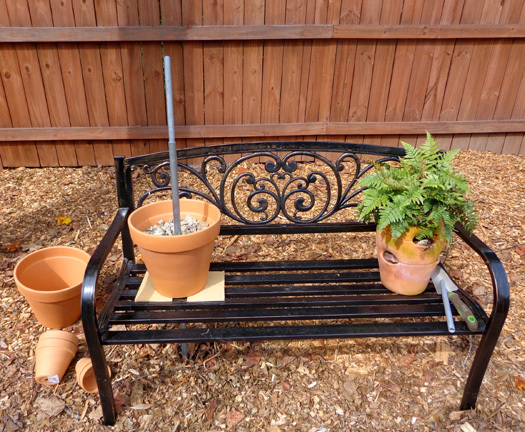 Handsome bench; beginning to build my pot person with a steel rod and stones to anchor it. Then I started researching clay pot people online and found a treasure-trove of ideas on sites like Pinterest and the site in the quote at the top of this page. Some pot people were elaborate, some quite simple. I wanted to keep mine rustic and simple. I drew a sketch in my mind only, not on paper, and built it as I went, with few modifications. 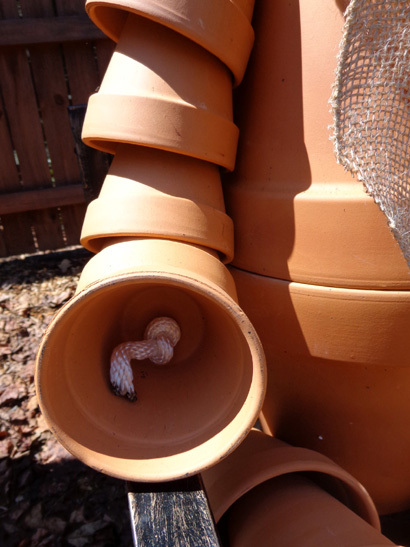 I gradually assembled the clay pots I needed, starting with two 12" pots for the torso and a strawberry pot with holes in the side for the head. 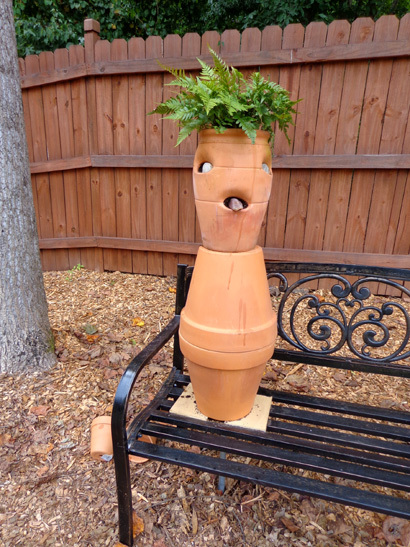 In all my online research I haven't seen a strawberry pot used for the head but when I saw it at Home Depot, I immediately saw two holes for eyes and one for a mouth! That was the most expensive part of the whole figure. I brought home an 8" and a 6" pot to see if they'd be proportionate for the arms and legs (yes), then purchased enough of each size to get started. Jim already had a piece of sturdy steel tubing (next photo) that fit through the holes in the torso pots. I showed him where I wanted the pot person to sit on the bench and he drove the tubing into the ground to stabilize the upper body in case of high winds. Then I filled in the two torso pots with small rocks to support the heavy strawberry pot, which I filled with potting soil and a fern to resemble hair. I found two round white rocks for eyes (might paint them blue later on) and an oblong reddish rock for a tongue. I poked them into the appropriate holes to resemble a face. Folks use various methods to attach the arms and legs to the torso. I tried styrofoam first, but it wasn't stable enough. Then I used nylon rope, which is probably the most common method. I wound it around the neck for the arms and the bottom of the torso pot for the legs, then strung pots one at a time. a cool place to sit by "Susie" and enjoy the rest of the yard. Later I added some plastic sandals that Jim never wears, some old garden gloves for hands, a burlap scarf around the neck, and a garden hoe. It'll be fun to dress her up for holidays. I picked a location for the bench and pot person close enough to the house so neighbors in the two-story houses around us can't see it. I want it to be a private joke for us and our guests. I can also see it from several places in our house; I smile every time I see it. 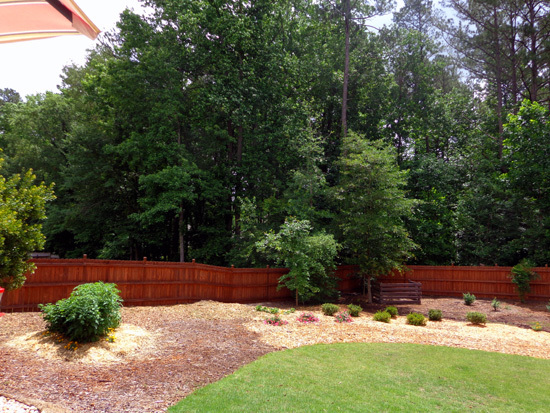 Next entry: scenes from Peachtree City -- cart paths, lakes, parks, golf courses, critters, etc.